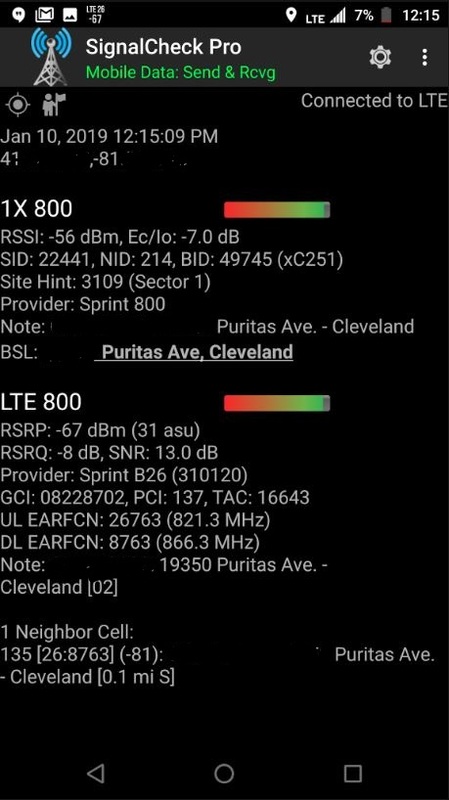 Sprint’s tribanding project has reached a new phase -- former Clear LTE 2500 only sites are getting new equipment as reported by nowerlater in Cincinnati, Joski1624 in Cleveland, and here in Columbus. Converting sites from LTE 2500 only to triband LTE 800 MHz, LTE 1900 MHz, and LTE 2500 will significantly improve network performance in the traditional metropolitan areas of markets where Clear sites reside. Adding LTE 1900, LTE 800, CDMA 1x1900, and 1x800 will mean stronger signal with improved building penetration that will allow surrounding sites to better serve their more immediate coverage areas. This added site density will be a key factor in performance improvements needed for high quality VoLTE (Voice over LTE) service. Upon completion, site density for the non-LTE 2500 bands will increase an astonishing 57% in Franklin County (Columbus) Ohio. There are currently 162 macro sites not counting factory and private office building sites. There are 93 stand-alone Clear sites. Hamilton County (Cincinnati) will show a 61% increase in site density for the non-LTE 2500 bands. Additional Clear sites lie outside these counties in both markets. The level of increase will vary from market to market. Market wide LTE 1900 performance will improve if this increased site density allows for fewer 1x1900 CDMA carriers per site. This would allow refarming of spectrum to increase the bandwidth for LTE 1900. Minimum LTE bandwidth allowed by many of Sprint’s Remote Radio Units has been increased in recent months according to the FCC. This will be market dependent. There will be a 50% or more LTE 2500 capacity improvement at most Clear sites. Mini Macro Clear sites broadcast only one or two carriers, while most metropolitan areas triband sites broadcast three carriers with up to five carriers at some sites. 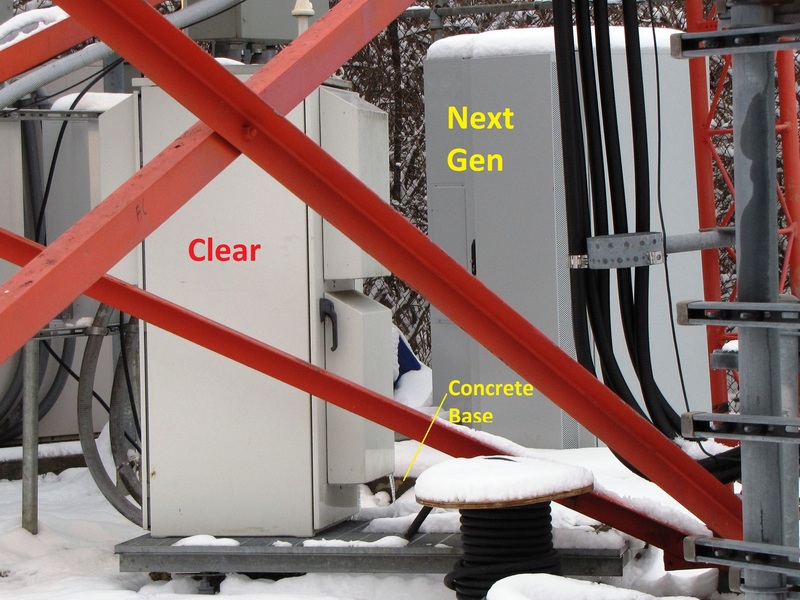 The tribanded Clear sites go from having Mini Macros to 8T8R remote radio units at most sites, but some sites may retain existing Mini Macros in some markets. With 8T8R, these tribanded Clear sites will also get improved performance and coverage. 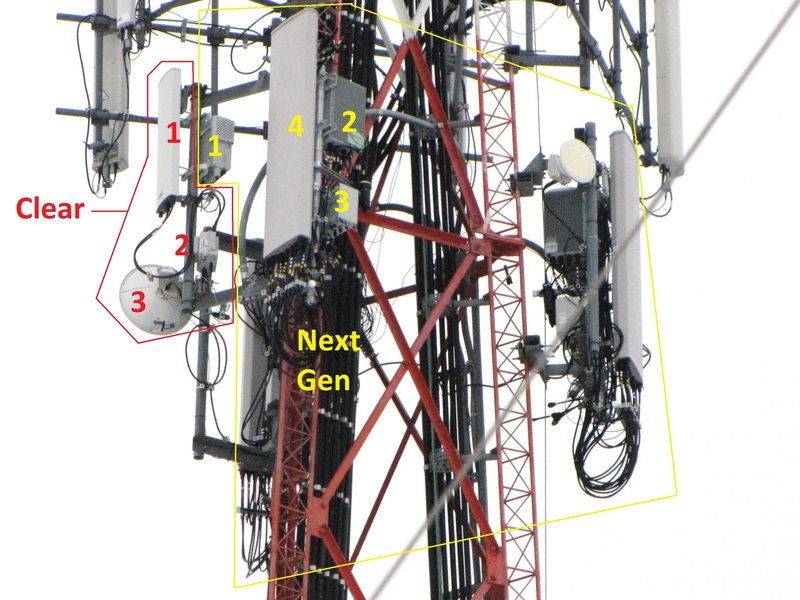 Samsung Clear equipment used in portions of the south and east often have three carriers thus will primarily gain benefits from the improved coverage of the 8T8Rs. Tribanding the Clear Mini Macro sites will also improve the LTE 2500 performance of surrounding triband sites. If your phone is on the third carrier and you currently drive into an area primarily served by a Clear site your triband site signal will get weaker and weaker until it drops. The LTE 2500 at these existing Triband sites currently carries an extra burden. ALTC1800834: ANTENNA UPGRADE TO AN EXISTING CELL SITE OF SPRINT. REMOVE (3) ANTENNAS, (3) MM RRUS, AND (3) 15/64" COAX. INSTALL (3) ANTENNAS, (9) RRHS, (3) 1-1/16" HYBRID CABLES, GC SUPPLIED RET CABL ES, (3) OPTIC FIBER JUNCTION CYLINDERS, (3) POWER JUNCTION CYLINDERS, (1) SITEPRO SNP-12NP SECTOR MOUNT AND HANDRAIL KIT. REMOVE EXISTING CLEARWIRE GROUND CABINETS AND INSTALL ALL NEW SPRINT ECAB & ICAB COMBINATION CABINET AND PPC ON NEW CONCRETE PAD. REMOVE ALL POWER AND FIBER CABLING TO RRHS. Permits and drawings were also found in Sacramento by our resident staff Tim (lilotimz), with one site even going from CA to Massive MIMO: The Network Vision plus LTE 2500 using 8T8R LTE 2500, LTE 1900, and Four Port LTE 800,and the much rarer Massive MIMO LTE 2500/5G future, LTE 1900 and Four PORT LTE 800. Here is a photo of a Columbus Clear site being converted to Triband. You can see that the Clear Band 41(inside red outline) is still wired and was quite functional at the time of the photo. 1) Clear antenna (remove), 2) Mini Macro (remove for most sites), 3) Microwave antenna for redundant backhaul (will likely remain if present). This is becoming a Triband Hexadeacport 16 port Antenna Setup outlined in yellow with 1) 8T8R LTE 2500 Remote Radio Unit, 2) LTE 1900 Remote Radio Unit, 3) LTE 800 four port Remote Radio Unit, 4) 16-Port Triband Antenna. In this next photo you can see the old cabinet on its metal grate and the new cabinet on new concrete. The underground conduit needs to be placed then the concrete poured before you will see cabinets. Some of the sites will have double cabinets (permits say Eltek, but observed cabinets do not match catalog). Note that they are pre-assembled, in this case by Stonecrop Technologies. These sites are also getting new Purcell cable boxes. 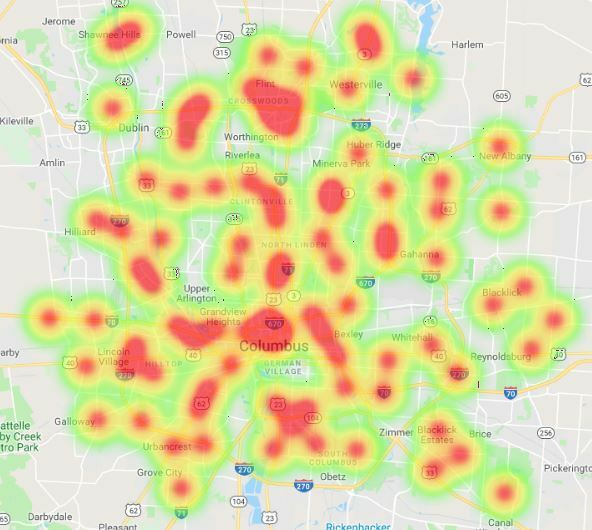 In Columbus, 86% of the Clear sites have permits. New permits are still being filed. We began finding permits for Clear conversions last October. Permits are active for one year. They can be extended, but typically the work will be done in that time period. It is quite possible the FCC will not approve the merger into T-Mobile until December or later based on the Shentel – nTelos merger. This merger could finish sooner or not at all. If the merger is approved this work would likely stop, but any completed site work would benefit existing Sprint customers during the estimated two to three year transition period (market dependent). Please note that actual site coverage areas are not circular but are shaped between a three bladed airplane propeller and a three leaf clover. There would be significant variations from the heat map above. Of course Columbus overall has Network Vision and other Next Generation triband sites. If your city is listed above, how will you know if you will benefit? Start looking looking at the Clear sites in your city today and be observant of any changes. Help is available here at S4GRU.com if needed. Online guides can help: Nokia Mini Macros on Macro Sites, Samsung LTE 2500 Remote Radio Units and Antennas. It will be worth knowing if your market will benefit from the significant capacity improvements of the Clear site Triband conversions! Edited 2/8/19 to better cover Samsung Clear Sites. 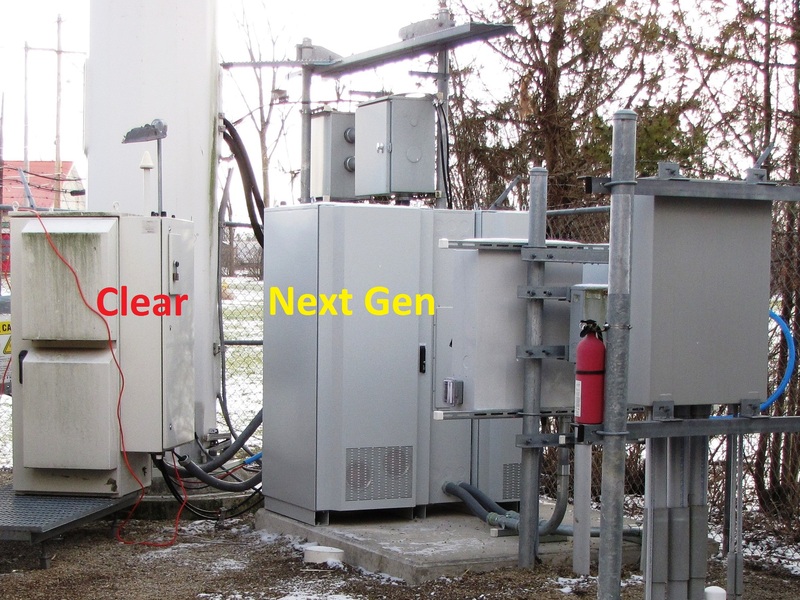 In the Missouri Market I have notice that the GCI for Clear towers have changed within the last month or so. Is this a part of this process? It is quite possible you are at step 8 of the process so far as we understand it: 1) permits obtained, 2) tower improved if needed (plates added for strength, safety ropes changed, etc. 3) trenches dug and conduit installed, 4) concrete poured and cured [or metal grate expended according to some permits], 5) cabinets arrive and are positioned, 6) antennas installed then cables, 7) wait, 8)LTE 2500 Carrier Aggregation switched from Mini Macros to 8T8R, 9) LTE 2500 third carrier is soon added [sometimes next day], 10) LTE 1900 and 1x900 CDMA and then LTE 800 and 1x800 are added [uncertain of exact order]. Ultimately coverage of the new triband site and surrounding sites will need to be fine tuned which could take as long as a couple of months. You would want to find the site by GCI and look and/or take pictures to be certain. The first site in Cleveland was picked up around Thanksgiving in logs so your dates are reasonable. It is quite possible you are at step 8 of the process so far as we understand it: 1) permits obtained, 2) tower improved if needed (plates added for strength, safety ropes changed, etc. 3) trenches dug and conduit installed, 4) concrete poured and cured [or metal grate expended according to some permits], 5) cabinets arrive and are positioned, 6) antennas installed then cables, 7) wait, 8)LTE 2500 Carrier Aggregation switched from Mini Macros to 8T8R, 9) LTE 2500 third carrier is soon added [sometimes next day], 10) LTE 1900 and 1x900 CDMA and then LTE 800 and 1x800 are added [uncertain of exact order]. Ultimately coverage of the new triband site and surrounding sites will need to be adjusted which could take as long as a couple of months. In the Samsung markets (Midwest, northern West Coast) we have also seen the LTE 2500 GCIs change to match that of the LTE 1900 and LTE 800. The GCI sectors go to being sequentially ordered by sector across all bands. This is step 10 for the Samsung markets. Let me get your some pictures first. I think they might've just change the GCIs and still no LTE 1900 or LTE800. I'll also export my log too. The thing to look for in general is the 41/42/43 3rd carrier endings as Nokia Mini Macs don't support 3+ B41 carriers while Nokia and Ericsson macro 2.5 equipment can. I've seen a few Clear to Triband conversions in the Seattle. I reported a few a couple of weeks ago. Sorry I missed that. I only saw discussion of new LTE 800 in the Seattle thread going back to November. There have reportedly been some Clear to NV conversions a few years ago especially in the upper peninsula of Michigan, but most were isolated cases. Many of these sites were basically public protection sites, but they did do a good job of covering their small town in the WiMAX days, often before any other carriers had LTE in those areas. Most of the Clear sites outside of major metro areas in Ohio were completely removed after the WiMAX shutdown, although one was later converted to LTE 2500 in Portsmouth, Ohio. The EARFCN does line up with what is LTE 2500 3rd carrier in most markets which is not possible with Mini Macros or the Clear LTE equipment. Definitely worth a look at the site for equipment for LTE 1900 and LTE 800. Edit: except Samsung Clear Equipment which can handle four carriers [credit: lilotimz]. Ok. I'll stop today on the way home. I pass a few of them so I will try to get several pictures. This is awesome! There is a Clear Band 41 site about a block away from my home in New York that would be an insanely strategic infill site if it were converted to a triband site. I am about in the same position at a mile away. I can get around 100Mbps of LTE 2500 in portions of my house from a Clear Mini Macro site. Historically my LTE 1900 and LTE 800 were pathetic and dropped calls on a regular basis (fortunately I rarely make calls). Recently it has been better since the closest Network Vision site was upgraded to Next Gen, but nothing to brag about (definitely essential to have if the Clear site goes down). My LG V20 phone can handle VoLTE, but Sprint is going at a slow pace in terms of VoLTE on specific models. I have many other phones without VoLTE capability so better CDMA would be great! Hopefully my permitted Clear Triband Conversion home site does get upgraded and also retained by T-Mobile (given a merger). Without the site AT&T is my best option, T-Mobile is acceptable but slow, Verizon is much worse. I live inside the beltway in a very competitive market. At various times all carriers have lead the Root Metrics Columbus market ranking for network reliability and call performance in recent years. Hopefully this will make it Sprint's turn again! Only Samsung Clearwire sites show up in SCP and those are capable of up to 4 LTE 2500 carriers. Many of them were upgraded with the 3rd B41 carriers in the past year. Given the vendor contracts dividing up the country, these Samsung Clear sites will likely go through the same process mentioned above. They were mostly located in the south and east coast, but it should be noted that many of them were converted to Mini Macros. So if you see Clearwire third carrier LTE 2500 in Signalcheck Pro, it is still worth checking out the site for equipment for Tribanding. In case anyone wants to know, there's 142 original standalone Clear sites in the Cleveland market. A vast majority of them are in Cuyahoga county, but a handful reside between Lake, Lorain and Medina counties. Excellent work on finding 10 Clear Triband Conversion sites!! I like your offer of free sponsorship for those who help to find more! Most people don't realize that 1/2 of our finds are from people with android phones just going about their everyday lives with SCP Pro logging enabled which just records the lat long of the best signals. Then you just send in the log every so often. Does anyone have any updates for Expedience sites that never got the upgrade to WiMax, like Dayton OH? A few of these expedience sites did get upgraded to triband sites a while ago. Also some Expedience sites in Anchorage, AK! Very informative and interesting read! It'll probably be a while before our NV 1.0 equipment get's upgraded here since Sprint doesn't own any band 41 licenses here. So confirmed the sites here in STL that area reading Sprint B41 that use to be Clear sites are still Clear sites. They only changed the site name.